Edit: This thread is archived. If you scroll down to the Challenge #6 section of the downloads page, you’ll see that the models can still be downloaded for your tests, and also that a gallery has been made of top entries. Lighting Challenge #6 is on-line! All shading and rendering techniques are fine. Any minor tweaks you want to make to the scene are OK. 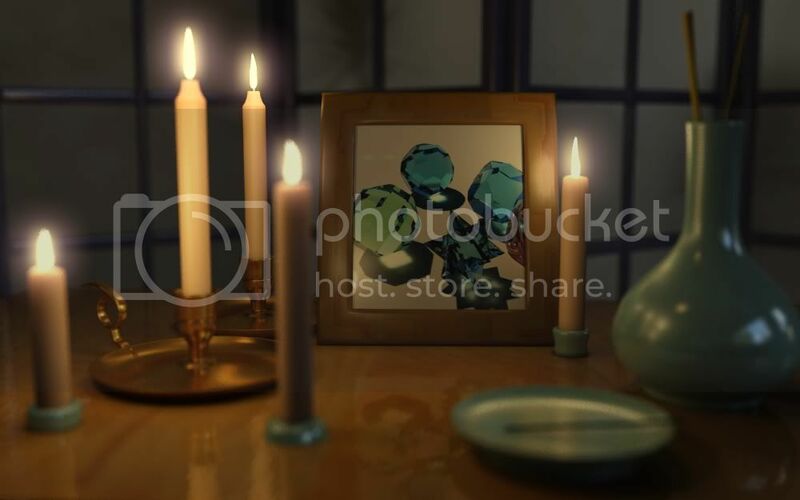 The rules are to have fun, make a cool candle-lit rendering, and share how you did it afterwards. Looks great Jeremy, can’t wait to give this one a try. Let me start this up after a long break where I moved to another continent for a job. Oh what a wonderful challenge #6! Can not wait to get my hands on that scene after this weekend. I would appreciate if you could offer a 3ds file too. obj-file was merged into one mesh with texture selections. 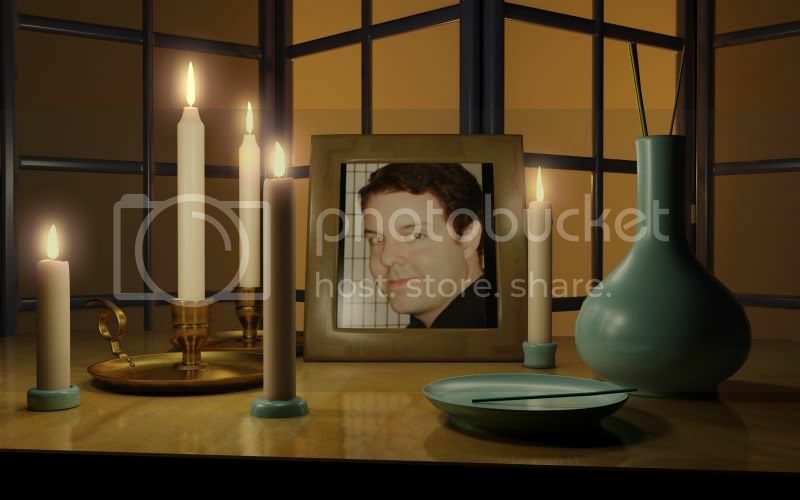 @lazzhar: I like the lighting and translucency on the candles. Just the flames looking too bright and flat at the moment. Welcome back and congratulation for the new Job. @ lazzhar - “FIRST!” Congratulations on the job! I was wondering about you, the guy who always posts great lighting work but had to look for work from Algeria. So now where to? France? UK? Singapore? USA? Canada? ? Well, I was more thinking of “worship of a god” style thing. But maybe the red mood made it a wee bit too somber and looked like some form of memorial. Hi all, this is my first posting on the cgtalk website. I look forward to your feeback! I want to put a little more light coming in from the right on the vase. It was rendered with ARTVPS Renderdrives. There is no GI or SI involed and unfortunately there is no SSS material to use for the candles… but I faked self illumination with an ambient ramp. I have imagined a window bringing in blue light from outside on the right side with a door a jar on the left creating white highlights and some light. I’m thinking the screen at the back could do with something also! Greetings all! I have just discovered the lighting challenges! It was 2h30 am when the light was thrust upon my eyes! And now, it is 5h24 and I am a member and proud to be participating to challenge #6 Great work all of you! Good luck to all! My first lighting challenge entry. Thanks for the forum to show work and talk about it. This is a great resource. Render time is just under an hour with GI. Done in C4d. In my next pass I’ve got to to deal with those nasty glows around the candle lights. I feel like they’re a bit much and I forgot to render them in a separate pass. Clearly I’ve got my inner chiaroscuro going - five candles would probably generate more light than that. In my next pass I’ll add a fill light but not too strong of one. I like the atmosphere. I’m not sure what the odd blooms on the screen are all about. Something having to do with GI, I imagine, like photon mapping…I’m a broadcast design guy. We don’t do a lot of this kind of lighting. If anyone’s got an idea of how I can reduce that, feel free to send it my way. Oh man, I just noticed the floating candle…I’ll fix it next pass. @ Master Zap, I really like the translucency of the candles. They feel nice and waxy. 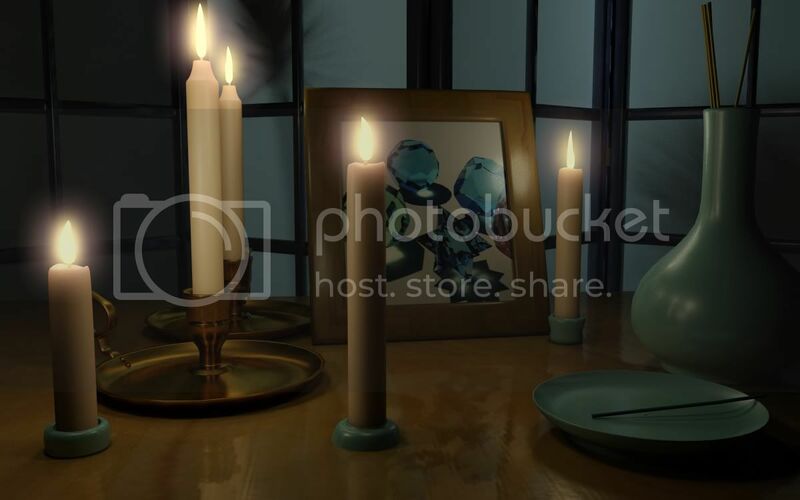 One thing that I love about MasterZap’s renders, especially the first one where it’s brighter, is the luster of the metal base holding the candles. That mix with very low diffuse but the right colored soft reflections and highlights creates a really nice feeling of a metal like brass or copper. barrymcw, welcome! That’s a good start! 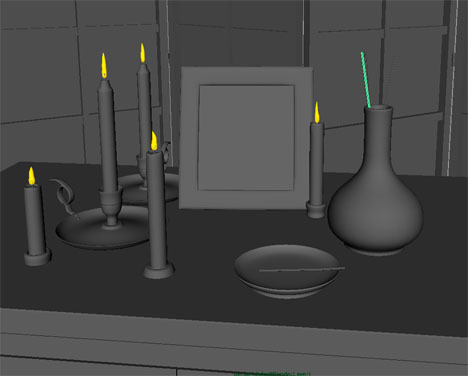 Sorry about the floating candle, I hope otherwise that the obj file imports well into Cinema 4D. If you take a look at the candle to the right of that one, it seems as if the sense of contact between the base and the ground could be improved with better occlusion or shadowing. The circles of light around each candle seem like something you could get rid of if the shadows were softer: the shadow of a candle itself onto the table beneath it shouldn’t be so clearly focused. Are the bright dots on the screen in the background photons from global illumination? Edit: Seggy - looks like you haven’t got an image to appear yet, but we look forwards to it. Thanks Jeremy and ChrRambow , as french people say: "Nul n’est prophète dans son pays "
Geat renderings Zap you really made me laugh for a while lol. Seggy: Very nice, except the material on the picture frame isn’t really working for me. But the glass/metal candle holders, and the plate, work perfectly! barrymcw: Yes those “glow blobs” are indeed a problem. Try to do what I did (which is a classic “trick” to get stuff to look “brighter”); layer a few glow-blobs of different radii. It’s the new mental ray “arch&design” material (the we unveiled at SigGRAPH) in pretty much the default copper preset. Actually everything you see is using that material, except the candles that are misss_fast*. Here’s a new rendering of mine w. some DOF plus I added some “off screen reality” with the help of a very dialed down HDRI w. a window to light/reflect in the scene. I dialed down the coloring of the asian screen backlight… hmm… now you hardly see my paltrees outside it. Oh well. Maybe the DOF is a bit over the top. I think I’ll try something completely different w. it now. I really liked Seggy’s glass candle holders! Oh, nice challenge! I’m cleaning it up for Lightwave/modo use. Shall I upload the LWO somewhere when I’m done? I’m going to wait for my computer to get here, then get stuck in. The 733 MHz G4 I’m using now is just too dang slow. Oh well, it should get here this week. Hi all, I am new here on the forum, and this is my first challenge.I hope my english is not to bad :). 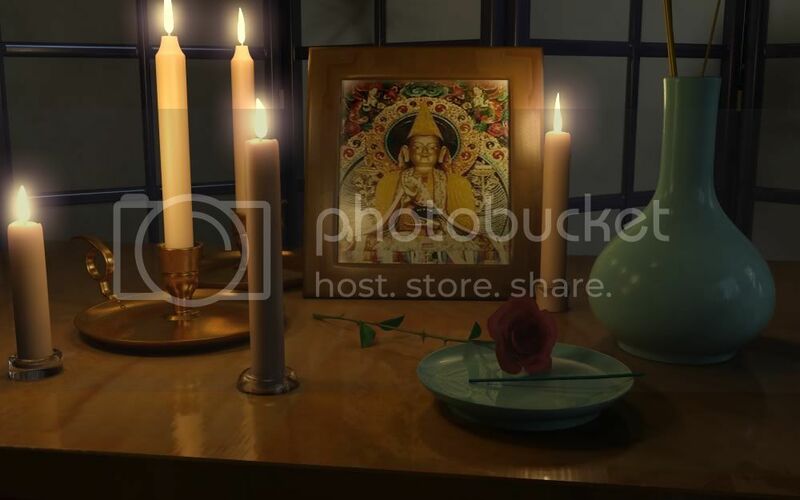 The image is made in blender internal render without AO, the shadows in the background look maybe odd but they look similar to the shadows cast by real candles. Great challenge once again, and some really great starts so far, I am looking forward to being able to finally post some work in this one once again. As I said, nice renders everyone, but I think one of the things that is looking just slightly off to me is the coloring of the candle light in most of these. It seems to me right now to be fairly whitish in color, when in reality candle light can be quite reddish…in my experience, even with indoor balanced film, it still appears quite orange/yellow rather than white. Anyways, just my 2 cents, but I really like some of the lighting that is going on here. MasterZap, nice renders, however in your last one the DOF looks off to me, too great of a difference between the non focused and focused areas considering the actual distance that it is convering. Otherwise though, very nice starts. Folgore, nice start. I would say that without the AO as you mentioned, your objects lose a great deal of connection with the table, try to add this in, or adjust your curent shadows to help give us some connection. Also, you are right about the shadows looking slightly off, try using some slightly softened shadow maps or soft raytraced shadows to help blend them a little bit better, I also feel that most of the shadows could be made to be a bit darker, rather than just upping the umbra, or coloring of the shadows, try to add some bounce lights to help lighten them up, this will aslo help to illuminate some of the pitch black areas of the unlit sides of your objects. And lastly the thing that looks the strangest is that the wicks of the candles are casting shadows on the back wall, this makes it appear as if the candles are not lit. Anyways, nice start, keep it up. Frame is better… but… still not as good as the rest. Here’s my problem - same as yours. With “more light”… it stops looking “candle lit”. I still don’t have the perfect solution… yet.